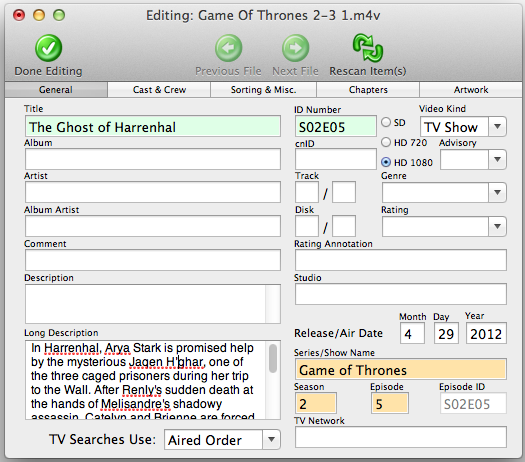 Chances are, your Mac is full of movies and TV shows—and your tags are probably a mess. IDentify 2 (Mac App Store link; note that the Mac App Store version is listed as 521) is a snazzy little utility to help organize your content. Feed IDentify a pile of videos, and it queries multiple databases (TagChimp, TheMovieDB.org, and TheTVDB.com) to fill in the missing metadata in your files. Using IDentify is simple enough. Click the Add Files button and point it at some MP4 videos. Depending on where your files came from and their existing tags, IDentify’s results can vary. 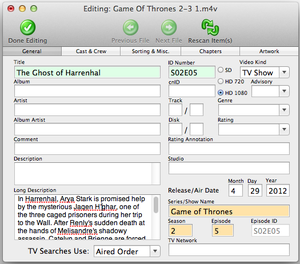 I tested IDentify with a variety of movie files and Season 2 of Game of Thrones ripped from DVD. Most of the movies succeeded, but my GoT episodes needed a little prodding to produce matches. For files that don’t match, editing the file names and re-scanning the files usually produced more complete results, although IDentify often requires a little bit of manual tweaking to complete your files’ metadata. Use IDentify to get the proper metadata into your video files.